Knock, knock. Who's there? The Rangers. The Rangers who? Talk about an identity crisis! 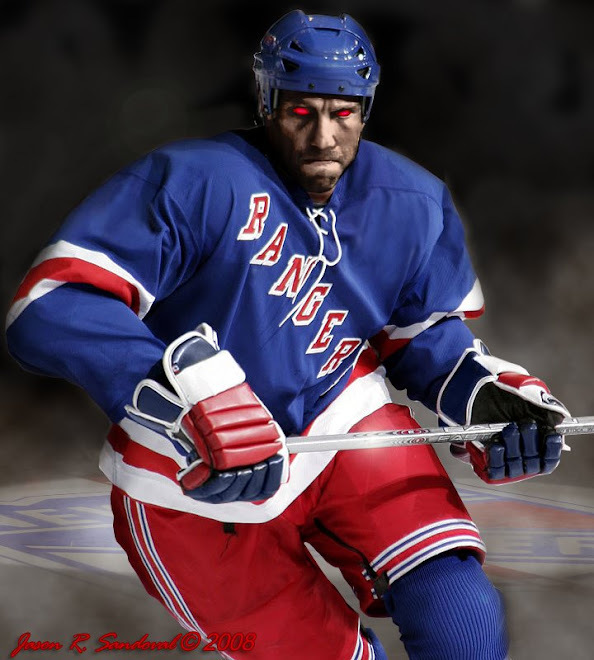 Last night we were exposed to our 'Sybil Blueshirts', the hockey personality disorder (a.k.a. MSG OMG!) when the squad looks like a team, the forwards play defense, the defense plays offense, the coach plays lines to shutdown opposing studs and the entire team communicates across all lines. 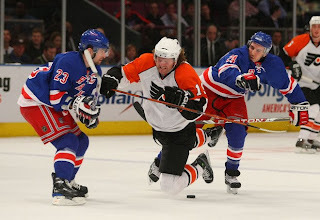 This unfamiliar NY Rangers entity finally solidified their going to the playoffs for the fourth season in a row by beating the Philadelphia Flyers last evening 2-1. Last night's treat was a solid, good-ole-fashioned hockey game - one frankly that could have gone either way - but the Blueshirts left it to the third period to shutdown any potential short-handed opportunities for Mr. Mike Richards or any physical altercations with Mr. Hair-Himself Scottie Hartnell. Knock, knock. Who's there? Jeff Carter who? Exactly. Hats off to NYR Coach John Tortorella for making certain Flyers invisible last night. All was answered when King Goalkeeper Henrik Lundqvist made some so-so & mostly spectacular saves in goal (37 of 'em) and special mention to an amazing glove save in the third against Daniel Carcillo, one of many that kept the Flies in check. The Blueshirts have a career goaltender in Hank, something our rival Philly does not have with inconsistent Biron and Nittymaki as 'alternating goal-mediocre-tenders.' No one can argue that Hank is the reason we are going into the playoffs - without our 'Rock in Net' we'd be vying for John Tavares as a first draft pick this summer. You say we made the playoffs without Jagr? Without Shanahan? You betcha, but it wasn't easy. In fact, it was downright brutal. In looking back, this newly formed Blueshirt bunch opened the season with a lot of undeserved wins -- call it good luck, but it kept us in first place in the NHL and division for a longer-than-deserved two months. King Hank kept them in the winning circle with a number of shootout wins up until around November, when luck decided it had had enough. The losses mounted and our little defensive system team couldn't hold back the onslaught, as we realized we didn't have any defensive studs.....and we were stuck with Wade Redden. Ugh. General Manager Glen Sather decided his job was in jeopardy and decided to fire Tom Renney and replace him with the anti-Renney, John Tortorella - the no nonsense, attack-hockey former Tampa Bay coach (with a Stanley Cup behind his belt). So our AHL-like team started to work a little harder, to justify their own contracts, the fans and to impress a new coach who wasn't afraid to embarrass them on ice and to the press. Something worked along the way and here we are....in the playoffs. Truth is, the team hasn't changed that much -- we were always a team who'd be on the cusp of just making it -- except our earlier record was deceptive and unfortunately for Tom Renney and his staff, I think the players got used to a winning record and he ultimately suffered for it. Defense may be the key to winning the Stanley Cup, but sitting through 42 home games of it makes for boring hockey --- look at the attendance in Newark!!? So we're in. Take your pick for the first round -- the Bruins or the Caps. Both lethal. Both scary. Both beatable. I'll take the Bruins. You? Oh, and by the way, The Rangers' win over the Flyers also helped New Jersey, giving the Devils the Atlantic Division title. Sorry to spoil the home ice party, Philly - see you Sunday. You goal report is a bit dyslexic. Callahan banged away at the puck, it came to Naslund, he swatted it into Biron and while he was fumbling for it, Timonen drove Callahan and Biron and puck into the net. Goal: Naslund. Avery outfought the Philly D behind the net, got it to Drury, out to Morris, in on the net, tipped by Callahan, who got the second goal. The refs ignored Mara writhing in pain on the ice, he finally staggered to feet, knocked Henrik's stick out of his hands, bumped into Henrik for good measure, leaving an open net for whomever. One freak goal cancelled the other. Your first sentence grammar is a bit dyslexic too. The MSG crowd was in full playoff form last night. A goodly number of Flyer fans but not an overwhelming amount. It was a terrific and intense game. I like a match-up with the Caps -- porous defense and Jose Theodore. The Rangers should have scored 2-3 more goals before Philly finally scored. Avery and Callahan missed easy goals. The game could have easily been 6-5. Philly owned the slot in front of Henrik. The ice was terrible thanks to the circus -- chippy and uneven, pucks bouncing over sticks for no reason. No matter, it's nearly time for the playoffs. The East is going to have great matchups. They shined BLUE last night and it was a hearty game. Avery is sure a difference maker on the team and he had orange skid marks left on him as the Flyers covered him with orange. Let's Go Rangers!!!! Come on Boston. Come on DC. Dark, With Lundqvist doing a great impression of "The Great China Wall" and the rest of the team playing their "B" game it was enough. Congrats goes out to the Players and Coaching Staff, It's been a very tough, up and down season for them. PLAYOFFS?!?! Who would have thought? Well, Dark, WE did. We believed from October. From Europe and back we've gone and battled, and finally on the 81st game of the season, we clinch. Only in New York would fans be so happy about a season of underachieving, but, we did make it, and now there is NEW hope. A new season begins and with that comes the possibility of defeating the shaky Jose Theodore or the overrated Bruins, who knows, anything can happen..
1) Agree that a Capitals matchup, far from a slam dunk would be our choice if we were the Rangers. 2) However from a fans/TV standpoint a rematch of Avery-Thomas, etc would be a more compelling series to follow!